Thread lace has also been called punch lace over the years. 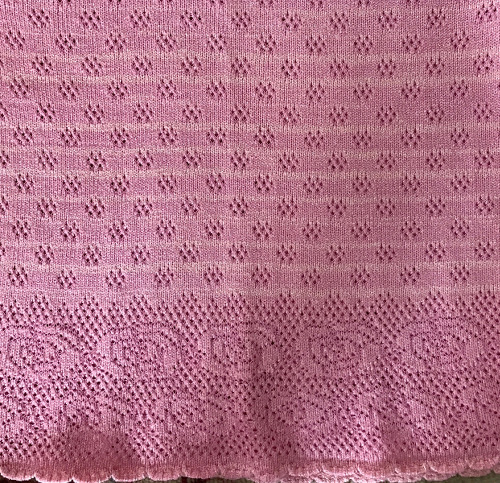 The “lace holes” are formed by knitting a fine thread with a significantly thicker yarn as the “second color”. When the fine yarn knits (B), a larger stitch in it alone is formed, with the thicker yarn floating behind it. The thicker yarn goes in Brother’s A feeder, the thinner in B. 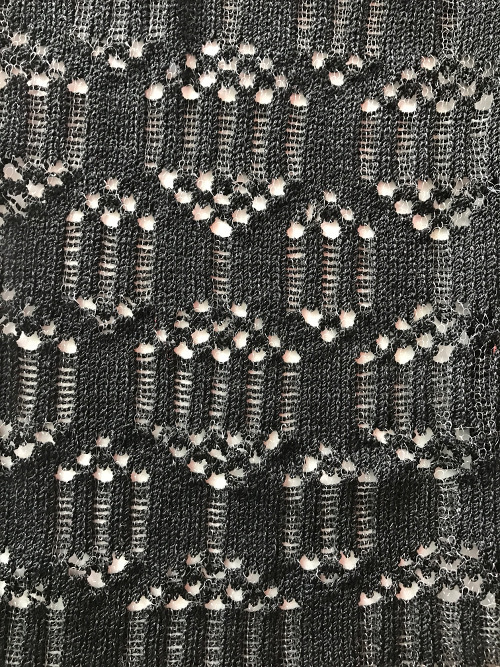 As in FI patterning, the unpunched holes/ blank squares/ no pixels knit yarn in feeder A, punched holes/ black squares/ pixels are knit in B feeder yarn. 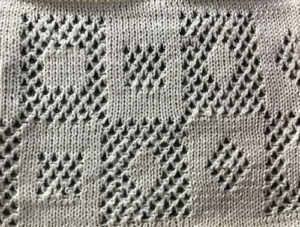 In this instance however, both yarns knit the unselected needles, corresponding to blanks in card or blank squares/ unmarked pixels. Tension may need to be adjusted due to this fact. Test swatches for tolerance to pressing/ steaming to make certain final garment will bear blocking and cleaning. I had a sweater front finished using an industry “clear” thread, thankfully tried to iron it before finishing the piece, and discovered a lovely melting quality to the clear “thread”. In theory clear serger thread should be safe to use, there are 2 easily available manufacturers. YLI brand (nylon) is stocked at most chain stores that carry sewing supplies. One “light / clear” is “whiter” than other; there is a “smoke” version as well, sold on cones. Both produce a bit of a sheen on the surface of the knit fabric. Sulky (polyester) clear is sold on spools, is superior for sewing pieces together, zippers, etc with no “sharp” when cut ends poking at the skin, but in a different price point and quantity. This was my garment’s test swatch, the black is a wool rayon yarn. Taking it to a garment (standard KM): color 1 = wool/rayon blend, color 2 = sewing thread. 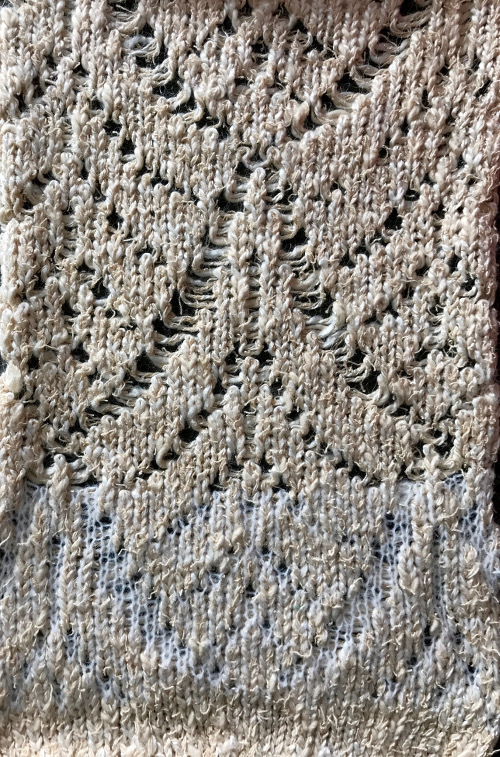 Note the difference in color where there is no needle selection for pattern, and how one color is more prominent on one side than the other. Sometimes the latter may be used to advantage when the goal is a plaited fabric, but no plaiting feeder is available. Simply program in a blank row, and position threads using thread lace setting to produce the knit. For more details for some unconventional uses for setting see post. I knit on a 910 electronic, with no option for such fabrics built into knit carriage. I was able however, to modify and use my punchcard carriage with the intent of producing yet another “unconventional”, ribbed fabric. Added tips: the tension dial usually ends to be a bit tighter than stocking stitch. The fabric produced is also thinner and shorter than stocking stitch, as is fair isle. The finished fabric tends to elongate when blocked. The setting may be used instead of plating. A plated, solid fabric is produced by non selected needles. 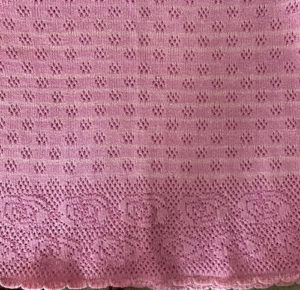 The thread lace thread tends to appear on the knit side, as opposed to the plating yarn, which appears on the purl side. The color mix may appear less even than in traditional plating. Simply lock the card or needle selection on an all “blank” row. 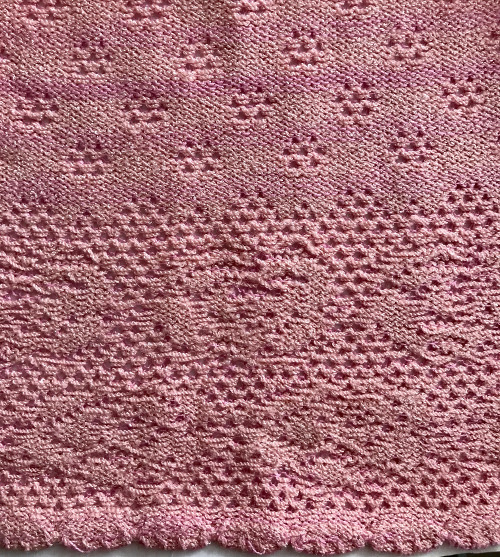 If the “lace” thread is too thick or too contrasting in color, the eyelet pattern may be lost. Simple geometric shapes are best. Some knit weaving patterns may also work well. In terms of altering the repeats using the buttons on the electronic models, double length or sometimes double wide as well as vertical mirroring may produce interesting results. Sewing or serger threads may serve as the thin yarn and match yarn color well if that is desired. On the select/memorize row both yarns are fed into the same feeder (A) as the thick yarn, and the “lace” yarn is then removed and placed in the second feeder (B). 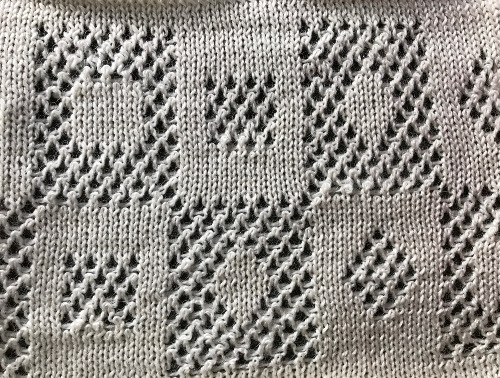 An option for drawing your own patterns: shapes can be superimposed on mesh designs as described in “filet crochet” posts, with no elongation of the motif. Punchcard machine owners may use tape over sections of card number 2, or card 1 which in turn gives the option of testing the design elongation X 2 for both eyelets and motif as well. The tape may be moved to suit, and once the pattern is satisfactory, the final pattern design card may be punched.